After trading away their first for Roy Williams and their second for more picks, this was the Cowboys’ first choice in the draft.Â If Goose Gosselin’s Top 100 is any indication — and it usually is — it wasn’t a very auspicious start.Â Â He was rated the 84th best player in the draft. Scout.com only publishes a Top 50 and Williams didn’t make it.Â Indeed, he was only the 11th ranked outside linebacker on their list. Pick Analysis: The Cowboys pick up an athletic linebacker with outstanding speed and quickness. Williams has the ability to rush off the edge and is a potential playmaker as an outside linebacker/special teams player. One of the most underrated players in the 2009 NFL Draft, Williams was a terror in opposing backfields since shifting to weak-side linebacker from strong safety as a sophomore. In each of his last three seasons, he ranked among the nation’s leaders in forced fumbles and tackles behind the line of scrimmage. As a sophomore, he tied for 10th in the country with three forced fumbles and ranked second in the Gateway Conference with 10.5 stops for loss. In 2007, he placed fourth in the Football Championship Subdivision with five forced fumbles, tying the school and league record. His 16.5 tackles behind the line of scrimmage led the team and conference. He would capture the forced fumble title in the FCS with six in 2008, as he also finished second in the league with 17.0 stops for loss. Williams’ 14 forced fumbles set the NCAA FSC career-record and is tied with Adam McGurk of Division II Adams State (2002-05), Kenechi Udeze of Southern California (2001-03), Terrell Suggs of Arizona State (2000-02) and Antwan Peek of Cincinnati (2000-02) for the overall collegiate record. His 42.5 stops behind the line of scrimmage rank seventh in school history, fourth in Gateway Conference annals and 21st in the NCAA FCS ranks. At DuSable High School, Williams was recognized more for his rushing and passing exploits than that as a linebacker. He led his team to an undefeated mark in the Chicago Public League’s Intra-City Central Conference as a senior and was a two-time All-City and All-Section pick. He rushed for 2,988 yards, threw for 3,015 and tallied 71 total touchdowns (35 rushing and 36 passing) in his career. Williams enrolled as a 200-pound athlete at Western Illinois in 2004, redshirting that season as a scout team strong safety. In 2005, he appeared in 10 games, seeing limited action early in the year while being listed third on the depth chart at strong safety. His special teams play helped earn him a starting position for the team’s final two games, as he posted 23 tackles (14 solos) with a stop for a loss and one blocked kick. Williams continued to excel on special teams in 2006. The All-Gateway Conference honorable mention shifted to weak-side linebacker. 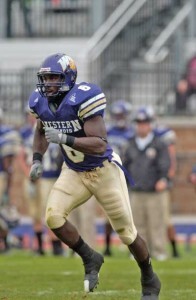 He was the only defender to start all 11 games for WIU. He was the recipient of the team’s Green Beret Award for his significant contributions to the kicking game. He ranked second on the team with 92 tackles (41 solo), including three sacks and 10.5 stops for loss. He also caused three fumbles. Williams was fourth nationally with a school single-season record tying five forced fumbles in 2007. The All-American and All-Gateway Conference first-team choice finished second in the voting for league Defensive Player of the Year honors. He led the Leathernecks with 107 tackles (42 solo) and eight sacks. His 16.5 stops behind the line of scrimmage led the conference, as he also recovered two fumbles. As a senior, Williams was named a consensus All-American and unanimous All-Gateway Conference first-team selection. He finished fourth in the voting for the Buck Buchanan Award, given to the top defensive player in the FCS ranks. He started every game at weak-side linebacker, leading the nation with a school season-record six forced fumbles, the second-best total by a Gateway player. He finished second in the league with a team-high 17.0 stops for loss and had four sacks among his 67 tackles (39 solos). Attended DuSable (Chicago, Ill.) High School, where he was recognized more for his rushing and passing exploits than that as a linebacker…Led his team to an undefeated mark in the Chicago Public League’s Intra-City Central Conference as a senior and was a two-time All-City and All-Section pick…Rushed for 2,988 yards, threw for 3,015 and tallied 71 total touchdowns (35 rushing and 36 passing) in his career. Positives: Good speed and hustle to chase down plays down the line or from behind. Comes downhill in a hurry, but can change direction if the runner makes a move. Takes on fullback blocks in the hole so others can make plays. Often played as a stand-up rusher. Solid wrap-up tackler in space. Will try to get under the pads of guards to hold his position. Forces turnovers by attacking the ball with his hands after securing the tackle. Active in coverage, with the quickness to stay with tight ends and running backs. Negatives: Has a strong safety build, thin in the legs and only adequate upper-body strength. May be a classic inside-outside linebacker “tweener.” Played inside quite a bit for but is better on the edge because he lacks the strength to hold up versus NFL interior lineman. Has tight hips. Could get off blocks better to make plays. Inconsistent getting through trash inside. Must learn not to overrun plays. Compares To: JAMES HARRISON, Pittsburgh — This is high praise for an unknown player, but the more film scouts watch on Williams, the more they will notice he has the “it” factor. With patient coaching and in the right system, he could turn into one of the better finds in this draft. He plays with excellent field vision and awareness. Williams demonstrates the instincts to quickly track down the ball. He has the change-of-direction agility and lateral movement to string plays wide and hits ballcarriers with force, driving with his legs to push the opponent back through the rush lane. Greg Norman and Chris Evert are getting married. Golfing legend Greg Norman and former tennis star Chris Evert will marry this weekend in the Bahamas, the Australian Associated Press reported Thursday. The couple, both 53, are to wed Saturday at sunset on a beach in Paradise Island, the AAP said, citing various media reports. The pair announced their engagement last December. Guests are believed to include former US presidents Bill Clinton and George Bush senior, American actor Chevy Chase, tennis great Martina Navratilova and singers Gwen Stefani and Kenny Loggins. Norman, who has won two British Open titles among scores of other tournaments, and Evert, who won 18 Grand Slam titles, arrived in Paradise Island on Thursday. Both are well past their heyday but they were indeed legendary figures in their games. Evert was America’s sweetheart for years, although overlapping careers with Billy Jean King and Martina Navratilova, who were arguably more dominant players. She was much more telegenic, however. Norman was one of the great golfers of the 1980s and early 1990s, although he’s probably best remembered for an epic collapse at the Masters. This news comes two days after Woods defeated Rocco Mediate in a playoff. Tiger Woods will miss the rest of the season because of a left knee that will require more surgery, a person with knowledge of the decision said Wednesday. Woods had surgery to clean out cartilage April 15, but later suffered a stress fracture while preparing for his return to golf. That’s what caused his pain during the U.S. Open, which he won in a 19-hole playoff Monday over Rocco Mediate. The person spoke on condition of anonymity because the announcement had yet to be made. Woods was expected to discuss his future on his web site later Wednesday. Woods was last seen in public late Monday afternoon walking with a pronounced limp across Torrey Pines toward the parking lot, the U.S. Open trophy in his arms. Upcoming surgery makes his 14th major title even more staggering â€” despite the stress fracture, he managed to win a U.S. Open that required 91 holes over five days. If the report is true, Woods would miss this year’s Ryder Cup. Tiger was in obvious pain at times on Saturday, Sunday, and Monday. I also heard a report that Woods was advised by doctors not to play last week. If Tiger needs to rest for 6 months, the PGA Tour will still be there when he comes back. I just hope no long-term damage was done by Woods playing in the US Open. On a semi related note, last Sunday’s broadcast got a 13.5 rating. (Hat tip- Ryan at GNN) Too bad for NBC the US Open isn’t played on the west coast every year, for 2009 the tournament is being played at Bethpage Black on Long Island before going to Pebble Beach in 2010. Also note Tiger won the last US Opens played at Bethpage Black(2002) and Pebble Beach. (2000) What are the odds he could win 3 in a row? A date for the knee surgery, as well as the necessary rehabilitation schedule, has not yet been determined. It’s simply amazing that he managed to play 91 holes at the U.S. Open, including a 19-hole playoff, in that condition. 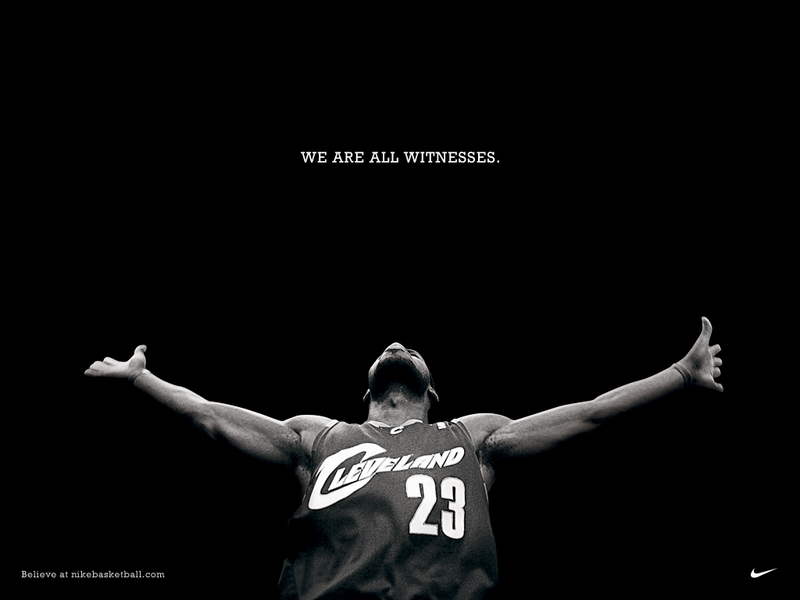 And win. Bill Jempty update- It is amazing Woods managed to play 91 holes. He has both ACL(Anterior Cruciate Ligament) damage in addition to a double stress fracture of his left tibia. I hope Woods didn’t permanently cripple himself by foolishly playing last weekend. Another US Open trophy wouldn’t be worth ending his career. 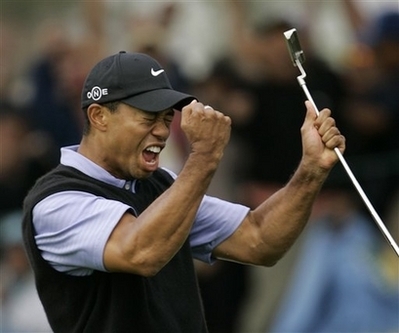 Tiger Woods shot two eagles in the final six holes to take the lead in the 2008 U.S. Open. Tiger Woods delivered a performance worthy of prime time Saturday in the U.S. Open. He kept an East Coast television audience and a sellout crowd at Torrey Pines in suspense when his left knee buckled and he nearly dropped to the ground from the sheer pain, limping along with his club as a cane. The drama came on the last six holes, when he turned a five-shot deficit into a one-shot lead. And the amazing array of shots that put him atop the leaderboard? Pure science-fiction. “The stuff he does, it’s unreal,” said Rocco Mediate, who watched it all unfold from the group behind. First came Woods’ 70-foot eagle putt on the 13th to get back in the game. Then it was a chip that he struck too hard, only to bow his head and laugh when it one-hopped into the hole for birdie on the 17th. Woods ended one of his most exciting rounds in a major with a 30-foot eagle putt on the 18th hole for a 1-under 70 and a one-shot lead over Lee Westwood. It was pure theater at Torrey Pines, leaving 50,000 fans and even his competitors wondering what hit them. Tiger Woods came into the 2008 U.S. Open not having played competitive golf in months while recovering from major knee surgery. The rest of the field didn’t have a chance. There was no limping into the weekend for Tiger Woods. In fact, he put on a near record-setting display at the U.S. Open that may have left the rest of the field feeling hobbled. Pouring in birdies from distances great and small, Woods tamed Torrey Pines, shooting 5-under 30 over his final nine holes in the second round Friday to end at 2-under par. That was one stroke behind Stuart Appleby and tied with Rocco Mediate and Robert Karlsson. Playing in his first tournament since knee surgery after the Masters, Woods hardly looked like someone rounding back into shape, at least not at the end. He started on the back, and after an up-and-down nine holes, things turned around immediately. He made five birdies and finished one shot off the U.S. Open record for lowest nine-hole score, last accomplished by Vijay Singh in 2003. He finished the day with a 3-under 68. He’s just not like the other golfers. Or any other man to ever play this game. His opponents are resigned to the fact that, if he’s playing anywhere close to his best, he’s simply going to win. Heh. I’m not sure Tiger couldn’t shoot par hopping on one leg. But really, how to stop what looks like an unstoppable march toward victory? Woods is in search of his 14th major win and his first U.S. Open since 2002. His seven closest pursuers (OK, so Appleby isn’t officially a ‘pursuer’) have combined for one: the PGA championship won by Davis Love III more than a decade ago. He’ll soon be looking for his 15th major, methinks. Update(Bill Jempty)- I had already written a long piece on how the US Open, when I saw James beat me to it. I’ll share some of my take. While Tiger is one shot out of the lead with 36 holes, I’m not ready to give him this tournament yet. Only a week ago we had a similar storyline forming at the LPGA. #1 woman golfer Lorena Ochoa looking for her third straight major, was up by one shot going into the weekend. A golf writer I like, blogged that only the weather looked likely to slow Ochoa’s march to victory. Instead, a tour rookie(Who had finished second twice already in 08) named Yani Tseng derailed the Ochoa Grand Slam express. What’s to stop the a similar surprise from happening this weekend? Second round leader Stuart Appleby has never won a major. The closest he has ever come was Appleby taking part in the 4-way playoff(along with Steve Elkington and Thomas Levet) at the 2002 British Open won by Ernie Els. 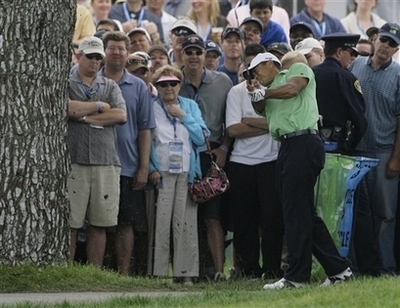 Other than that Appleby’s only shot legit shot at a major was the 2007 Masters. He led going into the final round before finishing T7th. Appleby has won eight PGA tournaments in his career. An argument can be made for he being the best player on tour without a major championship triumph. Off the course Appleby has a interesting story. Next month will mark 10 years since his wife Renay was killed in a fluke accident while the couple was in London England. After several years spent grieving, Appleby married again and has at least two children with his new wife. Appleby is a good player, but in spite of his having the lead he is being overshadowed by Tiger at present. The same can be said for the other golfers who are near the top of the leaderboard. Which include former major champions Davis Love III, Ernie Els, Geoff Ogilvy, plus more than solid international golfers Miguel Jimenez, Luke Donald, Lee Westwood and Robert Allenby. All of these players stand within two shots of Tiger and three of Appleby. Note- I have always liked Rocco Mediate since I watched him in person play in a PGA tournamenet about 20 years ago. Rocco, who is one shot back and tied with Tiger, would be my sentimental favorite. As much as I like Rocco, I know his chances aren’t very good on the weekend even if you took Tiger out of the equation. I didn’t think Tiger would win this week, and with him standing one shot out of the lead, the chances are strong I’ll be wrong. What I’m trying to say is Tiger isn’t a shoo-in to win the tournament. So long as he gets paid, Anthony Henry will play wherever the Cowboys need him. Anthony Henry is the Dallas Cowboys starting cornerback. But he is open to making a switch to safety, which could be a possibility if Pacman Jones is fully reinstated and first-round pick Mike Jenkins emerges. Henry, who led the Cowboys with six interceptions last season, started at free safety his first three years in college. He has worked some at safety in the dime package where Roy Williams usually lines up to cover the tight ends. It could allow the Cowboys to have four cornerbacks on the field. In stark contrast to Greg Ellis, who first resisted the move to linebacker and is now balking at moving to situational status to prolong his career, Henry is a team player who knows where his bread is buttered. Henry will be an outstanding safety, if necessary, and the best ball hawk at that position the Cowboys have had since Darren Woodson retired. John Smoltz valiantly tried to fight through the pain but he’s now having shoulder surgery that will sideline him the rest of the season and, quite possibly, end his career. Atlanta Braves pitcher John Smoltz will have season-ending shoulder surgery, but he hopes to return in 2009. Still, the decision to have surgery raises serious questions about Smoltz’s future. He turned 41 last month, and it would be highly improbable for a pitcher to come back from a major operation at his age. Smoltz had only returned from the disabled list on Monday, hoping to make it through the rest of the season as a closer after starting five games this season. The right-hander is the only pitcher in baseball history with 200 wins and 150 saves, and he reached another milestone this season with his 3,000th strikeout. While on the disabled list, Smoltz changed his pitching motion, going to a three-quarters motion to ease the pain in his shoulder. He came on in the ninth inning of Monday night’s game against Florida with a 4-3 lead but gave up three hits and two runs, blowing his first save chance since 2004. Manager Bobby Cox said the pitcher was “pretty sore” the following day, and Smoltz apparently decided that it was futile to continue his comeback even though he’s long indicated another surgery would probably end his career. He’s already had four operations on his right elbow, including Tommy John surgery that kept him out for all of 2000. Truly a shame. Smoltz is a class act and the Braves sure need him.